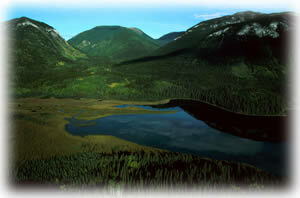 Chase Provincial Park is centred on Carina and Tomias Lakes, 70 km north of Germansen Landing. It is an extensive, very remote park that is virtually untouched and an undisturbed area of mixed forest and rolling mountain topography that provides critical habitat for the Chase-Sustut Woodland Caribou herd. Chase Provincial Park is a wilderness area. There are no facilities of any kind. Supplies and gasoline should be checked prior to travelling to the park. Suitable clothing should be worn and proper equipment for outdoor living carried. Visitors should be self-sufficient and have appropriate maps. Properly equipped 4 wheel drive vehicles are highly recommended as all driving from Mackenzie is on gravel road. Chase Provincial Park is located 70 km north of Germansen Landing. No road access into the park. A branch of the Finlay-Osilinka forest service road approaches the southern park boundary, but a crossing of the Mesilinka River is required to reach the park and there is no bridge to cross. The closest community, town or city is Mackenzie. History: Chase Provincial Park is a Class A park encompassing 36,266 hectares and was established on April 11, 2001. Chase Provincial Park was first identified for protected area status through the Mackenzie Land and Resource Management Plan process to protect critical habitat for the Chase-Sustut caribou herd. Cultural Heritage: This area is a First Nations traditional use area, for hunting, fishing and gathering. There are many traditional trails that were and are currently being used by First Nations groups. Conservation: The park protects critical habitat for the Chase-Sustut caribou herd. Excellent example of young mixed boreal forest in transition from Omineca Mountains to Williston Trench. Carina and Tomias Lakes have significant lake trout populations, plus Arctic grayling, rainbow trout and bull trout. The park has lake trout, Arctic grayling, rainbow trout and bull trout populations. See BC Freshwater Fishing regulations synopsis for site specific information. Anyone fishing or angling in British Columbia must have an appropriate licence. There are no developed trails at this park. Although there are numerous First Nations, game and local trails that can be accessed to various parts of the park, there is very little information on these. Visitors must be self-sufficient and experienced and have backcountry knowledge to travel these trails. Wilderness, backcountry or walk-in camping is allowed, but no facilities are provided. This area is very isolated and visitors must be both self-sufficient and experienced in the backcountry.